I made a Rescatux tour which might be interesting to be in the first place. Each of one of the Rescatux options in this article will have a link to their video so please check them too. Finally there’s the Super Grub Disk’s Halloween edition which it was not a Super Grub Disk formally but a Super Grub2 Disk with some scary messages about your computer being erased. What it’s funny is that as today a major Spanish downloads site offers the 0.9800 version for download. If you think it more carefully you will see that it’s kind of a benevolent trojan so that Super Grub Disk newcomers find that Super Grub2 Disk is the right choice (even if they are scared a bit;)). More than a year since the latest Rescatux stable release (Rescatux 0.29 at 11 Jul 2011 according to Freecode (former freshmeat). 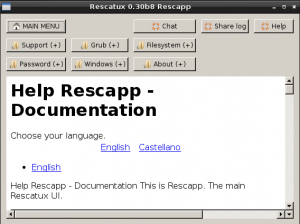 Rescatux 0.30 has been released as many beta versions that fixed minor problems, updated documentation to the current options and also tried to workaround some usability issues. 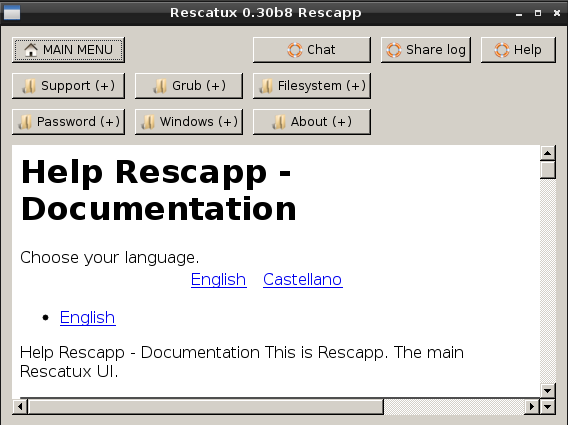 The different approach of Rescatux is found in its main program: Rescapp. Rescapp is a nice wizard that will guide you through your rescue tasks. Chat: Open the chat for asking help directly in Rescatux channel. Share log: After running an option you can share its log (the action registry that it has done) so that in the chat they can help you better. O better, even, you can help debug and fix Rescatux bugs on the fly. Share log on forum: Prepares a forum post alike text so that you can just copy and paste it in your favourite forum. Logs are nicely inserted into it with [CODE] symbols. Boot Info Script: Run Boot Info Script option to share your computer configuration (specially boot one). This option tries to fix this filesystem errors even if the filesystem seems to be clean and ok. The old chntpasswd program has been hacked so that you can use it from a GUI. You can just select your Windows drive and the user you want its password to be reset. Have you ever forgotten your Gnu/Linux password? Now you can change it from this nice wizard. As always you’re prompted to choose your Gnu/Linux installation and then the user which you want to change its password. Have you ever tried to run an special program as a normal user… but by doing it you have somehow borked your /etc/sudoers file? Don’t panic! Now after baking up your previous sudoers file a new one is generated on the fly. You just have to select which it’s your user. Not sure what’s the current situation with Windows 8 and Windows 7 but in previous versions once you reinstalled Windows (because of a virus or whatever reason) you lost your Grub menu. That meant that you couldn’t boot anymore into your Gnu/Linux system. The truth is that you can download the light-weight Super Grub2 Disk and boot into your system in a temporal way. But how to fix it permanently? If you’re not good at the Gnu/Linux command line you can just use Rescatux’s Restore Grub option. Sometimes the Grub configuration is no longer valid. Either your hard disks order at boot have changed (It should only affect to GRUB1) or you have added a new Windows installation and it’s not detected. Update Grub option let’s you rebuild your Grub configuration files. 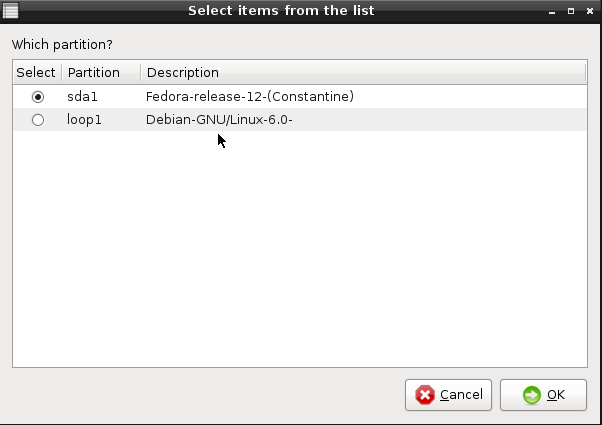 This option will only work in Debian based distros like Ubuntu. This option tries to restore Windows MBR but it’s kind of buggy because some users report that it’s not working for them. It probably works with no problem on Windows XP (without dynamic disks) and previous Windows versions. This is the reason why it’s a BETA option. You shouldn’t forget that Super Grub2 Disk is also included in Rescatux. Either you have an old 32bit system or a new 64bit system Grub2 integrated into Rescatux will detect it and load the corresponding kernel. There’s so many things to be enhaced in Rescatux that it’s hard to categorize them. Add extra tools like Parted Magic or System Rescue cd programs even if they don’t have a nice wizard option in Rescapp. Improve option: Restore Grub: Being able to restore non-distribution based GRUB1 installations. Improve option: Update Grub: Being able to use it in non-Debian based systems. Probably using grub-mkconfig from the live cd. Fix known bug: Filesystem Check does not prompt Failure when it fails. Save your non accesible files from Windows even if you cannot boot into it driven by Rescapp wizard. Just check the Rescatux Download stable section. Please check the Rescatux wiki for USB instructions. For the cdrom you can just burn it like any other live cd. Imgburn for Windows and Brasero for Gnu/Linux should help you. Make sure you burn it as an image not as a file.